Midway through the season, it seemed Panathinaikos would miss out on the EuroLeague playoffs, but the Greens made a drastic improvement to qualify in sixth position of the regular season with a 16-14 record. AGONAsport investigates. The start of the season couldn’t have been worse for Panathinaikos. Initially, the Athenians began the campaign with a tense victory over Maccabi Tel Aviv at home, but they then dropped an avoidable one-point loss to Bayern Munich in Germany. That defeat set the tone for the entire first half of the campaign, and until March, the Trifylli had only tasted victory in one EuroLeague road game. Panathinaikos’ away form was nothing less than terrible. The players admitted it themselves. Their lack of confidence on the road was blatant for all to see, and after an emphatic 68-89 loss to Real Madrid in Spain, head coach Xavi Pascual was fired. Managerless Panathinaikos subsequently dropped an 83-86 defeat at home to Armani Milano for their third loss of the season in Athens. Rick Pitino, a 66-year-old American coach known for his successes in college basketball, was hired to prevent the crisis from becoming a full-blown disaster. In his maiden game in charge, Panathinaikos immediately gave a stunning performance against perennial favourites CSKA Moscow at the OAKA Indoor Hall, upsetting the Russians 96-84. The manner in which Panathinaikos beat CSKA with such passion, desire and intensity gave supporters hope the slump was over. However, no problems are solved overnight, and it took awhile for the Panathinaikos squad to fully get to grips with Pitino’s style. While the home form picked up, the Greeks continued conceding defeats on the road, and the underwhelming shooting statistics weren’t getting any better either. Nevertheless, when the chips were down, Panathinaikos burst into life. In their last eight matches, Panathinaikos claimed seven victories which included a dramatic, last-gasp triumph at CSKA Moscow and a confident beating of Armani Milano in Italy. 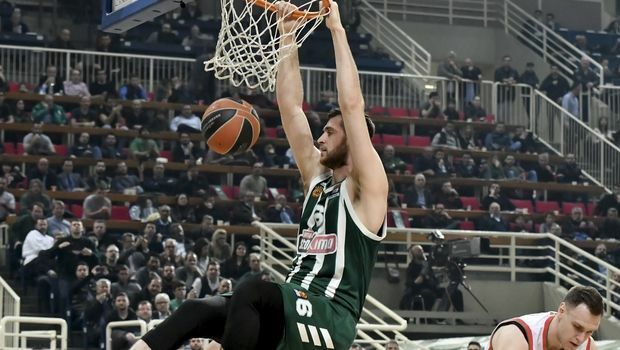 After Rudy Fernandez’s miraculous buzzer-beater at the OAKA on matchday 29, Panathinaikos had to wait until the final game to book their playoff spot, but they duly obliged with a comfortable win against Buducnost to qualify in sixth position. A fantastic achievement considering the state of Panathinaikos at the turn of the year. The mastermind behind the success. Before Pitino arrived, this group of Panathinaikos players was majorly underachieving, but he convinced them to believe in their abilities and play to their strengths. Players such as Deshaun Thomas and Sean Kilpatrick pointed out how Pitino reinstalled their self-belief, and even as an outsider, you can feel the family-like atmosphere within the team. Pitino brought the players together as a united group, and his troops responded by fighting for each other, the coach and the badge. Pitino is all about playing a high intensity, committed game with plenty of movement. One thing he hates is four players watching one guy shoot the ball. Paint touching and deflections are what make Pitino tick, and over time, the players have warmed to his ideology with outstanding results. It’s now down to Dimitris Giannakopoulos to persuade Pitino to stay beyond the current season. No one can underestimate just how crucial Calathes is to Panathinaikos. He’s the engine of this team. When Calathes is on form, Panathinaikos can beat anybody in Europe, and the gifted 30-year-old point guard was inspirational in the playoff charge. His jaw-dropping winner against CSKA in Moscow was the deciding moment of the entire regular season. In the victory against Buducnost at the OAKA, Calathes became only the second player in EuroLeague history to achieve a Triple-Double, tallying 11 points, 12 rebounds and 18 assists to take Panathinaikos to the post-season. The Assist King, he recorded at least 10 assists in four of the closing six matches, and he practically single-handedly beat Armani Milano on March 22 with 27 points. He will have to be at his best if Panathinaikos are to stand a chance of defeating Real Madrid. Thomas, Georgios Papagiannis, James Gist, Lukas Lekavičius and Ian Vougioukas have all taken their game to the next level with Pitino at the helm. At times, tall center Papagiannis appeared the weak link for Panathinaikos, but the 21-year-old became a dominant figure towards the end of the season as his confidence took a huge rise. Off the bench, Lithuanian guard Lekavičius (known as Luke Skywalker to Pitino) offers energy, Thomas’ shooting has improved and both Gist and Vougioukas are performing more consistently. American guard Sean Kilpatrick, who joined in January, has added extra enthusiasm. Panathinaikos’ playoff bid wasn’t made any easier by injuries. Taking into account the team’s issues, the loss of Nikos Pappas in January for the remainder of the season could have completely thrown Panathinaikos off course, but Pitino’s men were resourceful. Keith Langford, Thanasis Antetokounmpo, Ioannis Papapetrou, Matt Lojeski and Konstantinos Mitoglou all spent periods on the sidelines, however Panathinaikos found a way to earn positive results and keep the momentum going. Reaching the playoffs was a mammoth task, but beating Real Madrid is equally as challenging. Boasting the status of reigning EuroLeague champions, Real enjoyed a strong regular season with a 22-8 record, beating Panathinaikos twice and having defeated the Greens 3-1 in last season’s quarter-final series. Pitino needs to pull something out of the hat to finally take Panathinaikos back to the Final Four for the first time since the 2011/2012 season.